I went out to Inskip Point early on Friday morning to see whatever shorebirds were around. There are always birds to see out there but if you want to see greater numbers then you have to be out there on a high tide and when there are few people around. This means either early morning or last thing in the evening. 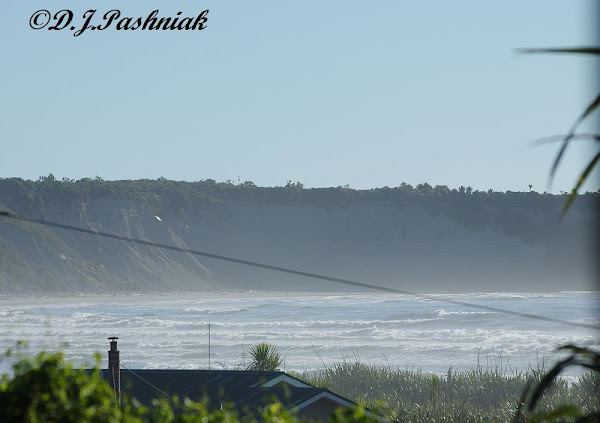 I was out there early morning before any 4 wheel drive vehicles had driven around on the sand and before any fishermen had walked around. 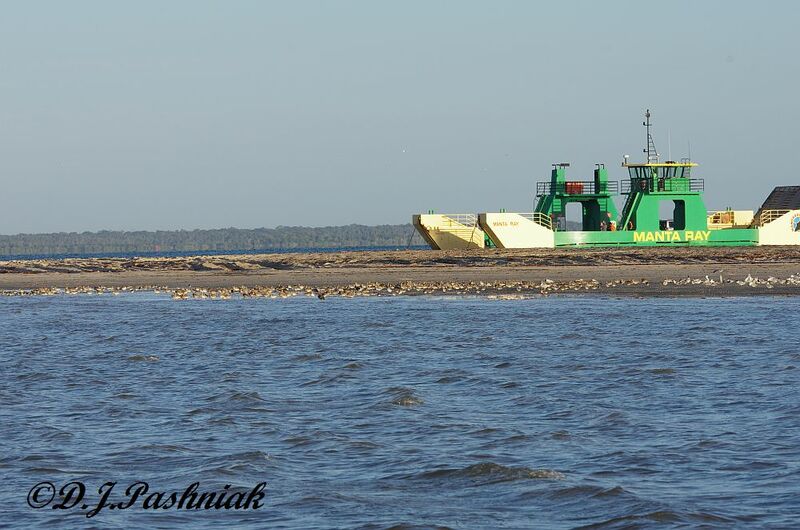 This photo is taken looking diagonally across the point to the car ferry which takes vehicles across to Fraser Island. The birds were spread out all along the waterline on the south of the Point. 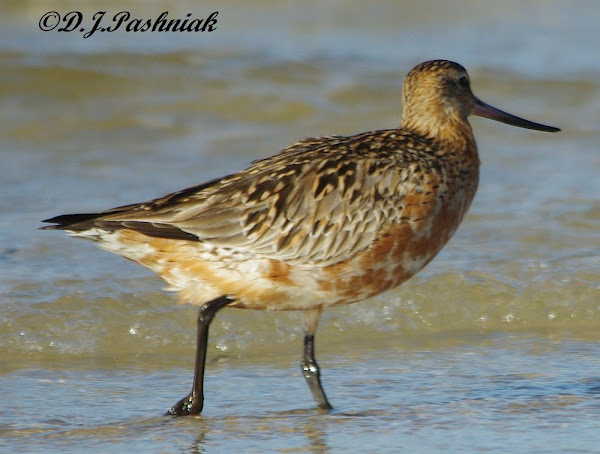 When I was out there a couple of weeks ago there were huge numbers of Bar-tailed Godwits - many of them in breeding plumage. This time the Godwits had apparently left on migration because the ones I saw were in non-breeding plumage. These were possibly young birds that will spend the winter here. 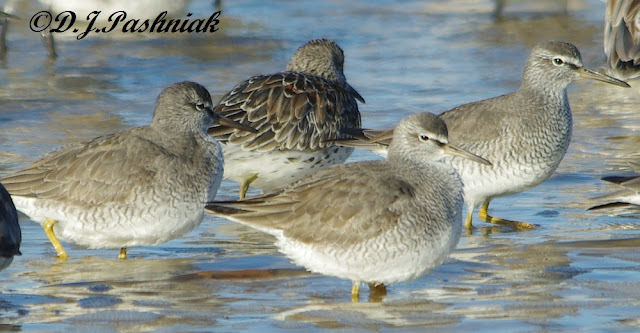 This time there were almost more Grey-tailed Tattlers than Godwits. 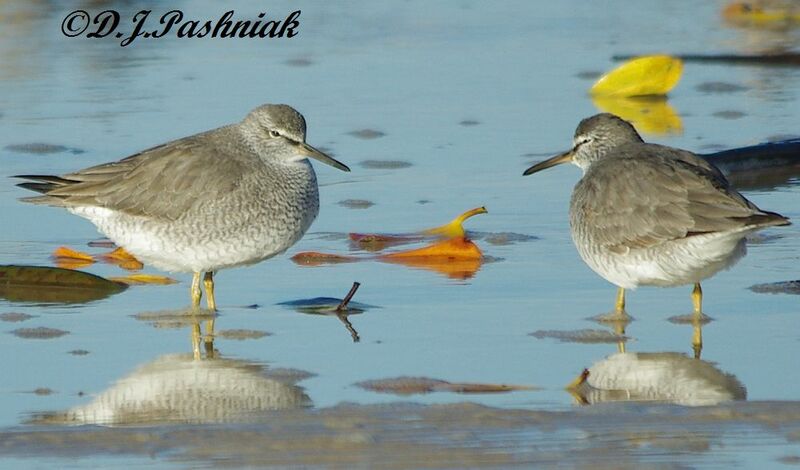 Grey-tailed Tattlers around here usually roost in mangrove trees. 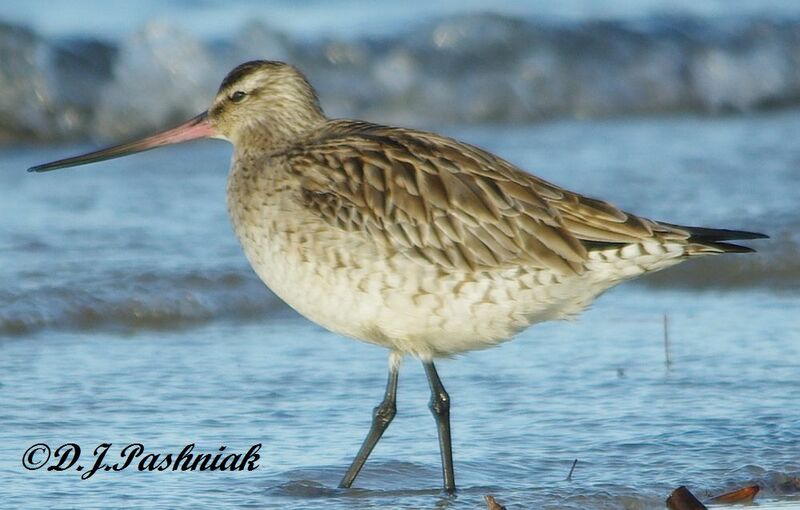 This time they were standing on the sand in nearly full breeding plumage and looking very plump. I had not previously photographed Tattlers with this amount of breeding plumage so I was anxious not to disturb the birds but to get as close as possible. It takes lots of patience and very slow movements - sometimes standing still for several minutes before again slowly moving forward a few feet. If you watch the birds closely you can see when they start getting agitated prior to them taking flight. Then you stop and stand absolutely still! I started taking photos at one end of the flock and then was able to very slowly move right down to the other end - well almost! A raptor flew over and put every bird up at one stage but most of them came down again and roosted very close to where I was standing. You can tell how well I did at not disturbing the birds because most photos had some birds with their eyes closed and/or their beaks tucked back under their wings. (Above - I am not finding this new version of blogger easy! 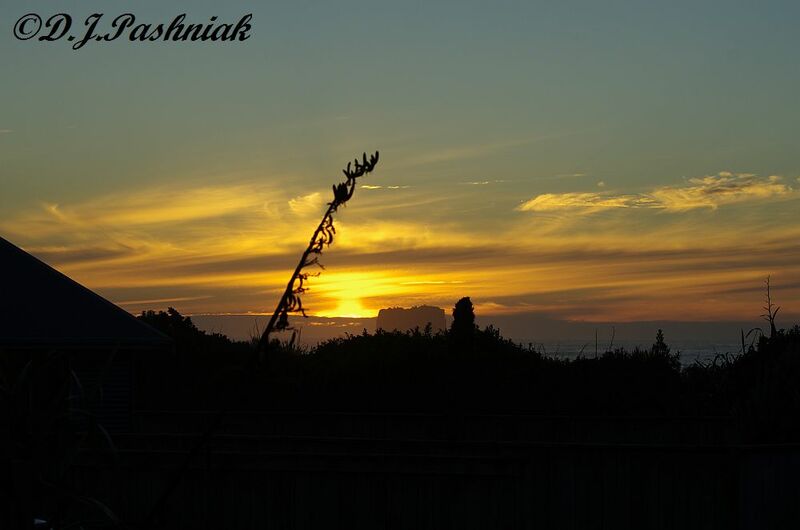 It hasn't let me put my photos where I want them!) 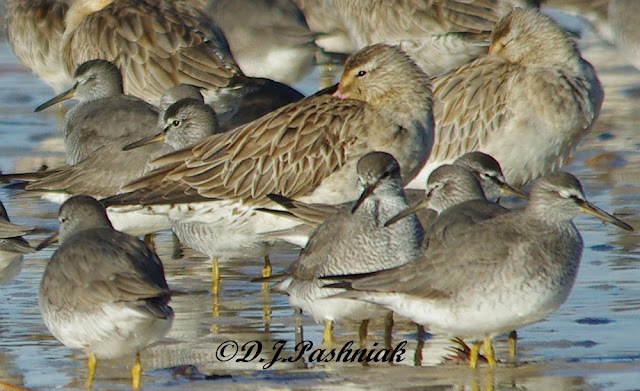 Tattlers standing among Godwits - a useful photo for size comparison. These two Tattlers were standing a little distance away from the others and I have cropped the photo to show just these two and the colors in the water and some leaves. The leaves have dropped off mangrove trees. Two days later some friends went out at a similar time in the morning to also see the Tattlers and they were all gone! Apparently they had left on their northern migration sometime in those two days. I was asked last week about my camera gear. I am using a Pentax K5 and this particular morning had on my Sigma 150-500 lens. I have been told by friends (and have also read) that this lens on a Canon Camera is not very sharp when zoomed all the way out. On my Pentax camera it does a good job and is as sharp as my other smaller lenses. The lens is heavy! I find it most convenient to use a monopod when I know I will be photographing for some time. There is good lighting early in the morning at Inskip when the birds are roosting on the southern side of the point so I have only cropped and re-sized these photos. Holidays are great but it's also great to get home again! My return home was in time to see some of the shorebirds before they took off on their northern migration. 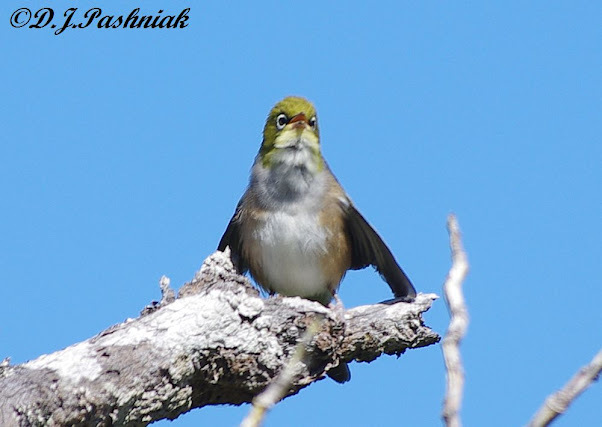 This is the time when the birds look their best in bright new breeding colors. 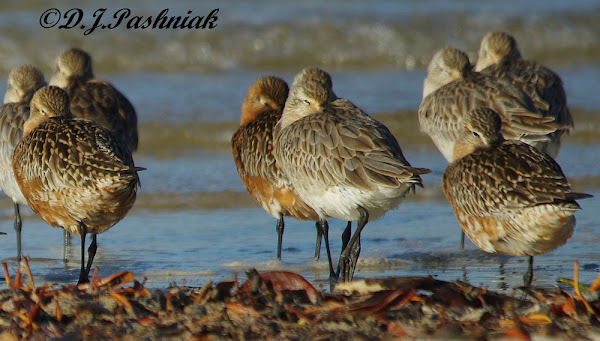 I was out at Inskip Point very early in the morning on a high tide and was able to photograph some of the birds in a very large flock that was roosting there. I could have spent a lot more time photographing the birds but 4 wheel drive vehicles came out and soon the whole flock disturbed and flew off. It is legal for vehicles to drive out there - but - the roosting birds must find it a great nuisance to be disturbed. As usual Bar-tailed Godwits made up most of the flock. When I got close enough I could see that there were all shades of color amongst the flock. Some were without any breeding colors. 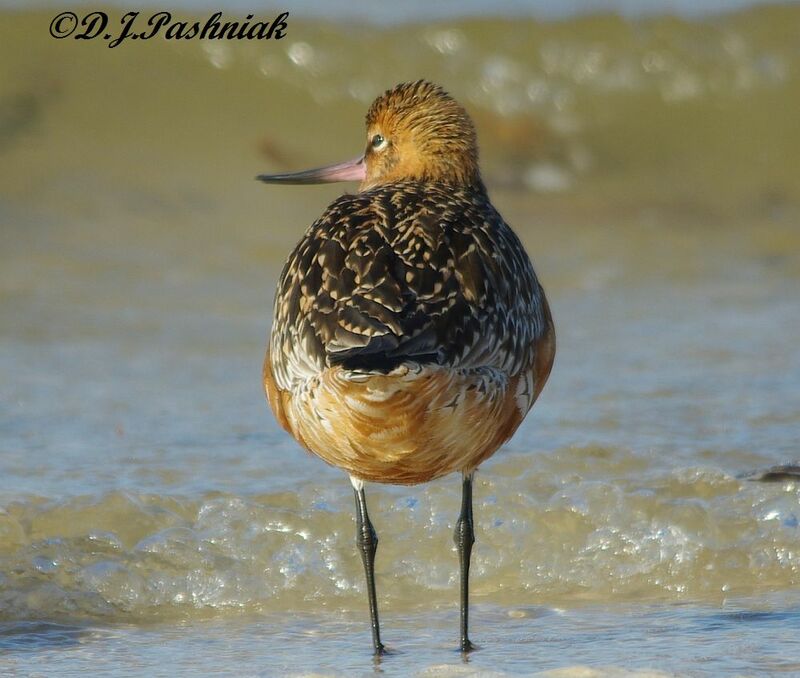 A bird looking like this will possibly be a young one and won't migrate this season. This one had good bright color and from this back view you can see just how much fat they put on before migration. The color was very patchy on some birds. The birds with the brightest color seemed to want to hide amongst the flock. This bird had the brightest color of all that I photographed. 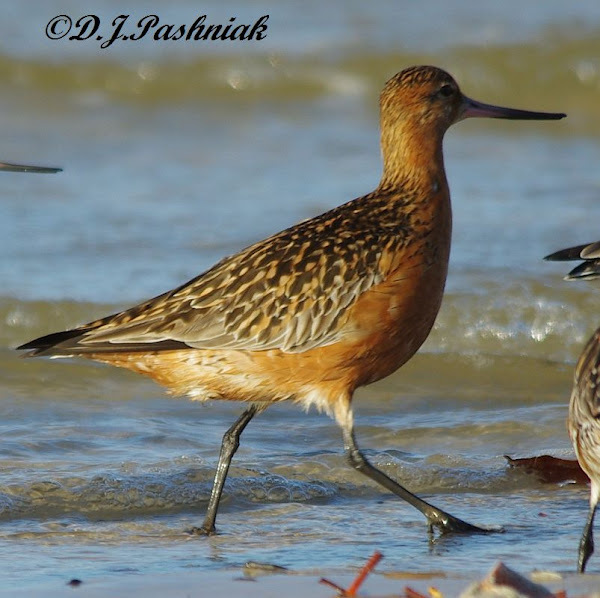 When the Godwits leave here they fly non-stop to the Yellow Sea area. This is a distance of approx. 10,300 Kms. They rest there for a month to 6 weeks and then make another non-stop flight to Alaska - a further distance of 6,500 Kms. They breed in Alaska and won't return here until September. This is another long flight of 11,700 Kms. and is also non-stop. These amazing flights were first documented in 2007 when birds were satellite tagged by scientists from New Zealand, Australia and the USGS. Details can be found here. 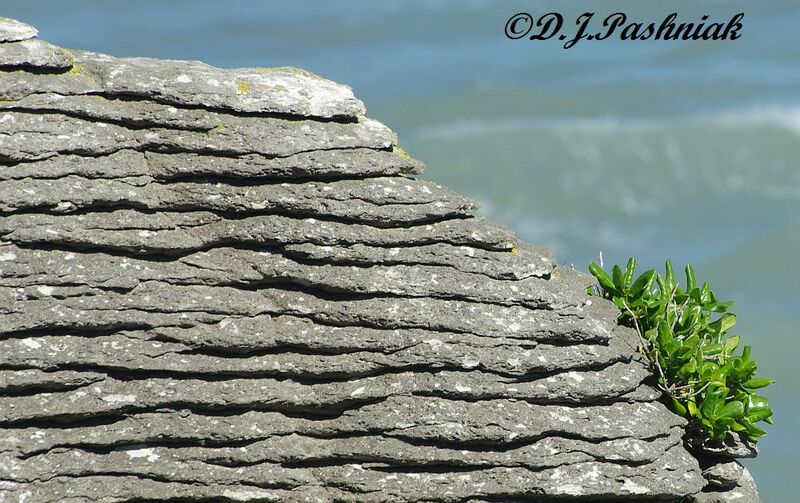 This little bird was sitting on a dead stump beside the track going in to the Pancake Rocks (see yesterday's post). I first noticed it because it was singing so loudly. 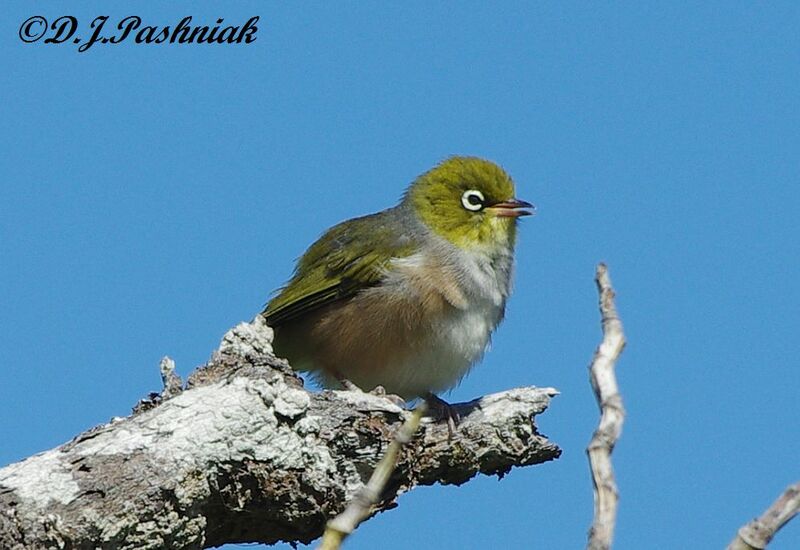 It is known as a Silvereye or Wax-eye and is found in both Australia and New Zealand. It was first noticed in New Zealand in the 1830's and because there is no evidence that anyone deliberately brought it into the country it is classed as a native species. It is slightly smaller than a sparrow. I heard lots more birds on our trip than I saw so it was very nice that this one was easy to see. Trip Part 14 - Final! Our trip up the west coast of New Zealand was aimed at seeing the Pancake Rocks at Punakaiki. We remembered this area very well from our trip here when we were children and the main difference seemed to be lots more tourists viewing the area and lots more barriers to stop people from foolishly getting too close to danger at the edge of the rocks. 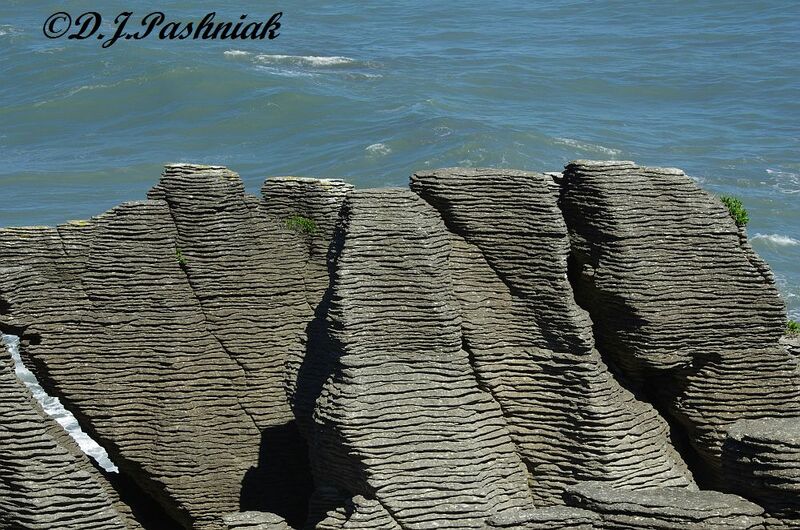 The Pancake Rocks have been formed by erosion between hard and softer layers of rocks. The result is spectacular. The rock formations have been upthrust from under the sea and the force of the sea is obviously still eroding the whole area. 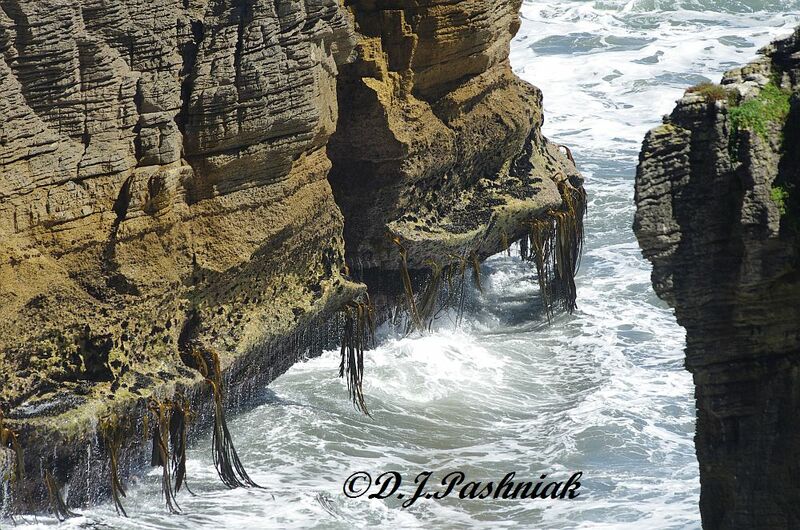 There are deep channels between and also under some of the rock stacks. 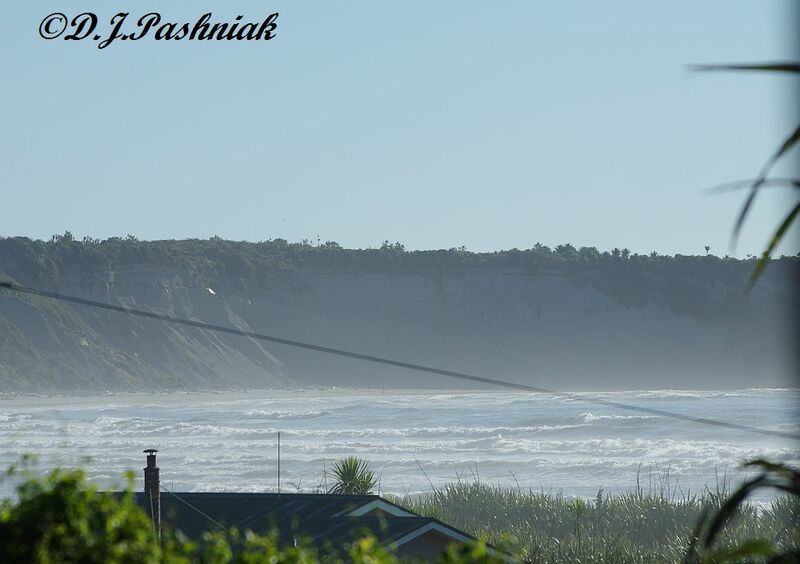 This photo was taken from the walking track out to the Pancake Rocks and looking south. 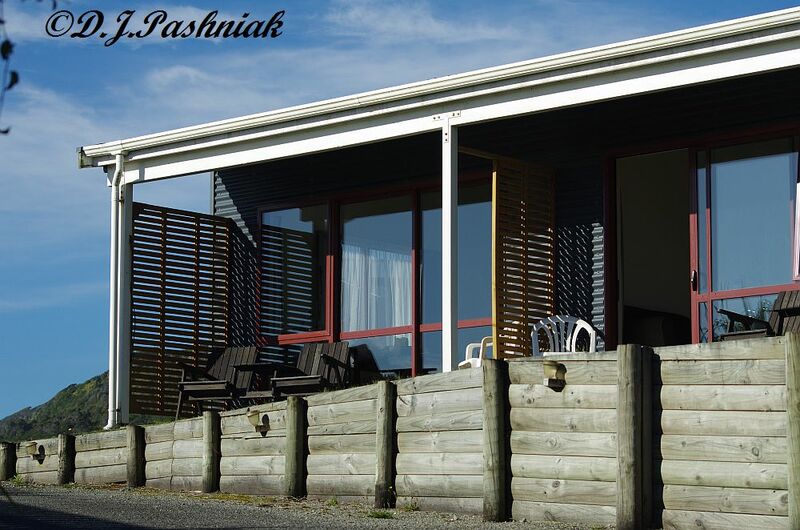 ...with the most spectacular view right out the front door of the motel to the beach just a few meters away. 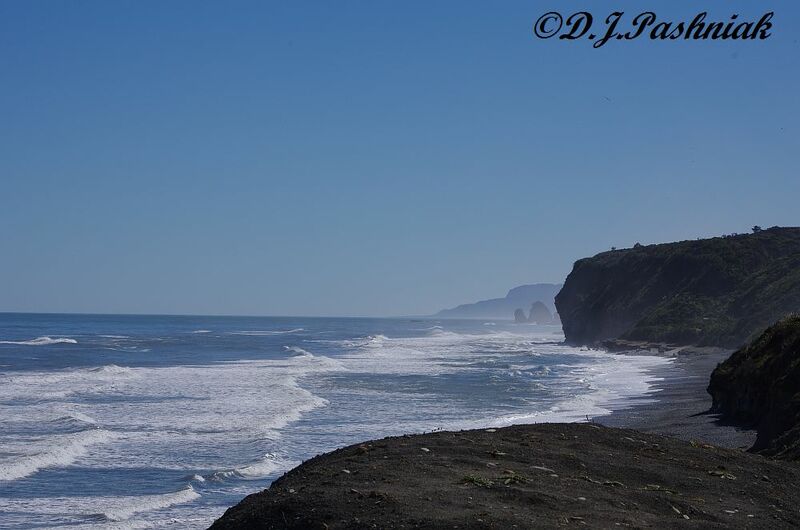 We went to sleep that night hearing the sound of the surf - a perfect ending to our west coast trip. The only thing left to show is one beautiful little bird. Tomorrow! 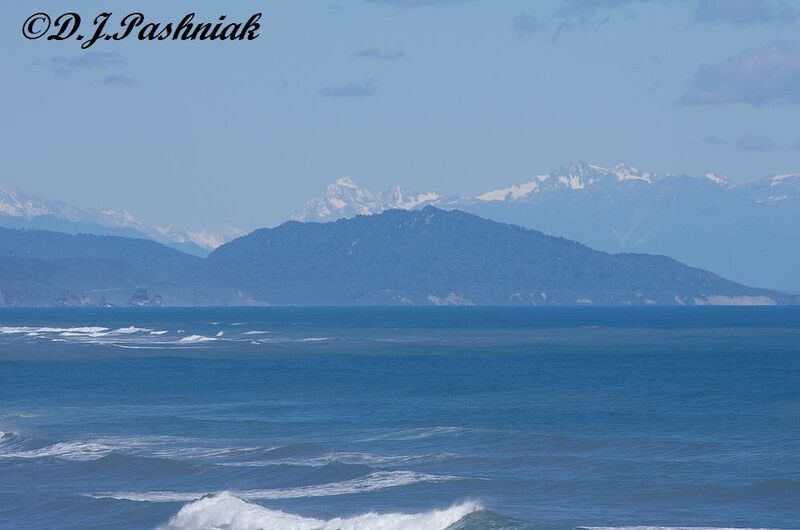 Scenery and a day like this make New Zealand picture postcard perfect! 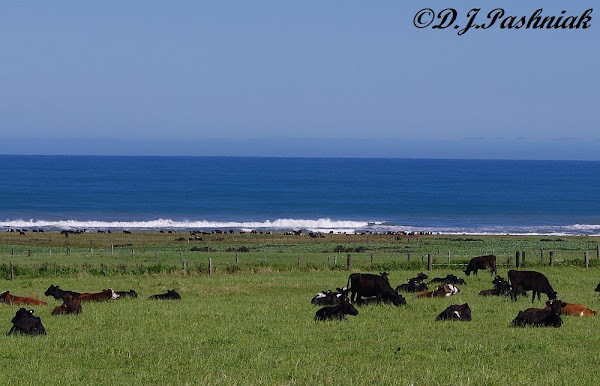 Green paddocks/fields, cattle lying down resting, the sea in the distance, and bright blue sky and sunshine. What could be nicer? 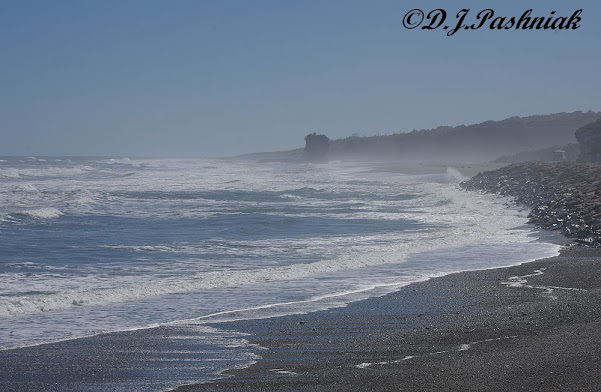 The coast line north of the city of Greymouth was beautiful but it was not a place where I would want to swim. Rocky headlands alternated with stretches of beach. 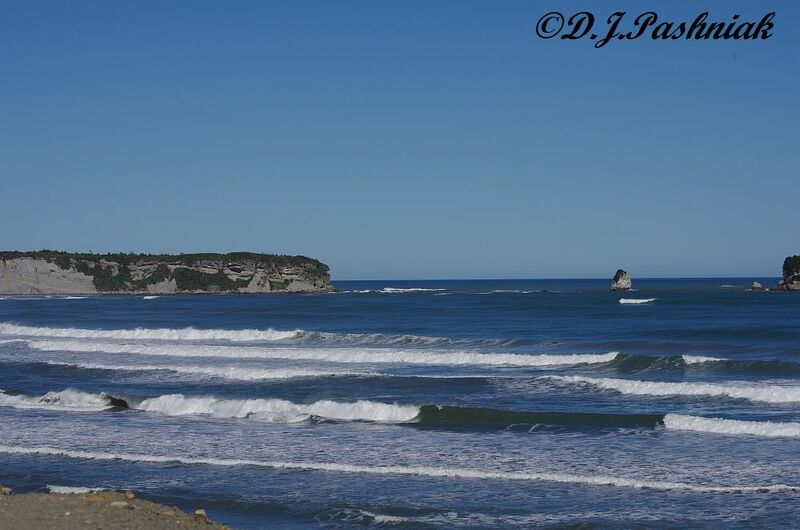 The sea was quite rough and the land looked as if it fell off quickly into deep water. 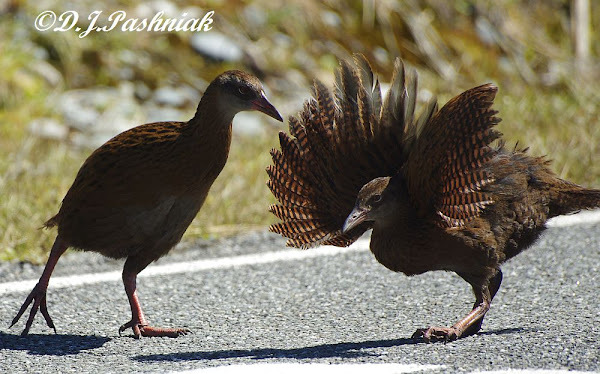 Weka are one of New Zealand's flightless birds. 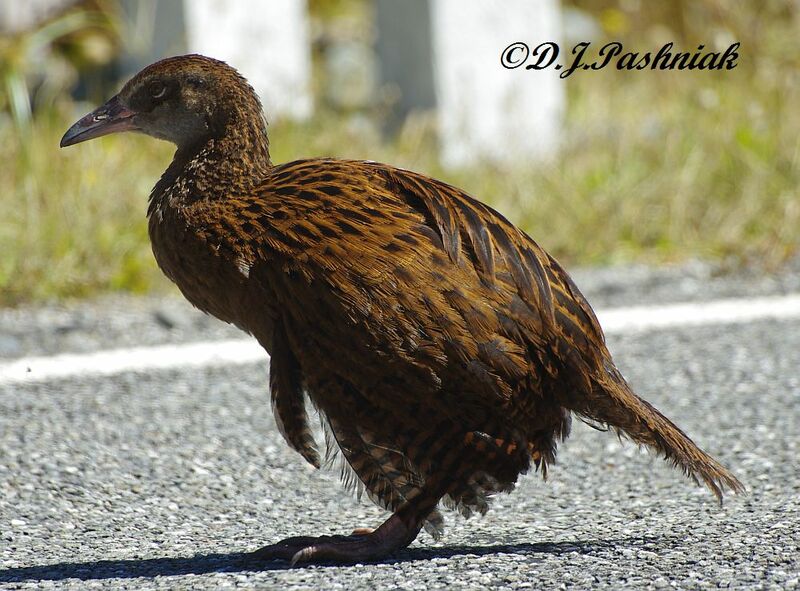 Weka Gallirallus australis) are part of the Rail family and are sometimes known as Woodhen. There are four sub-species and considerable variation of color. They are about the size of a domestic hen. Like other flightless birds in New Zealand they are under threat from introduced animals/pests such as cats, dogs, rats, ferrets, and stoats. 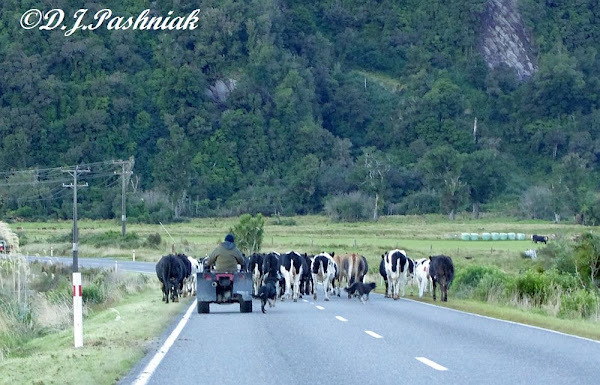 We saw these two on the road just around from Punakaiki on the West Coast (more about this place in the next post). 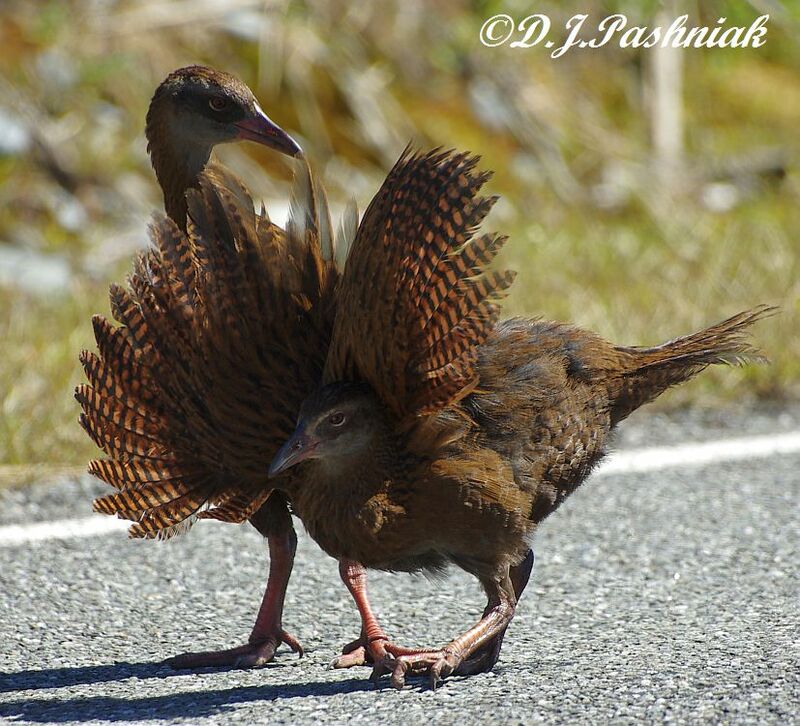 They were completely focused on each other and seemed completely oblivious of the traffic. 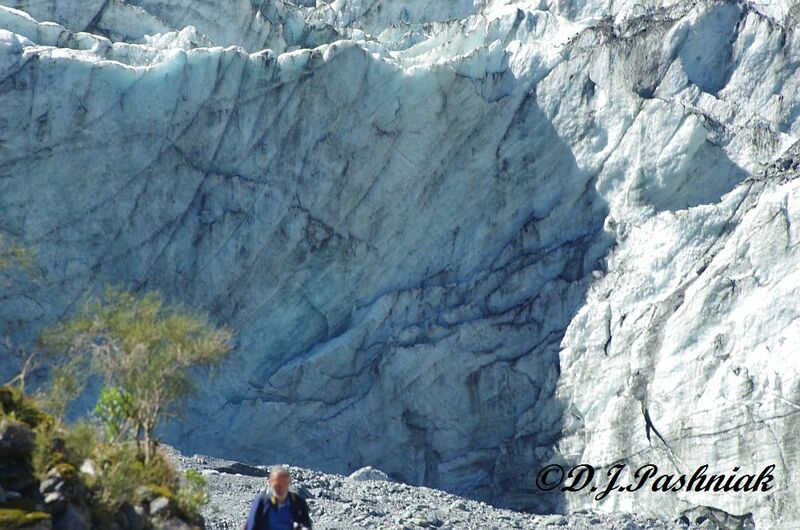 We stayed close to the little township of Fox so visited the Fox Glacier first. Both the Fox Glacier and the Franz Josef Glacier have retreated up their valleys for some years so there is quite a walk to get close to them. 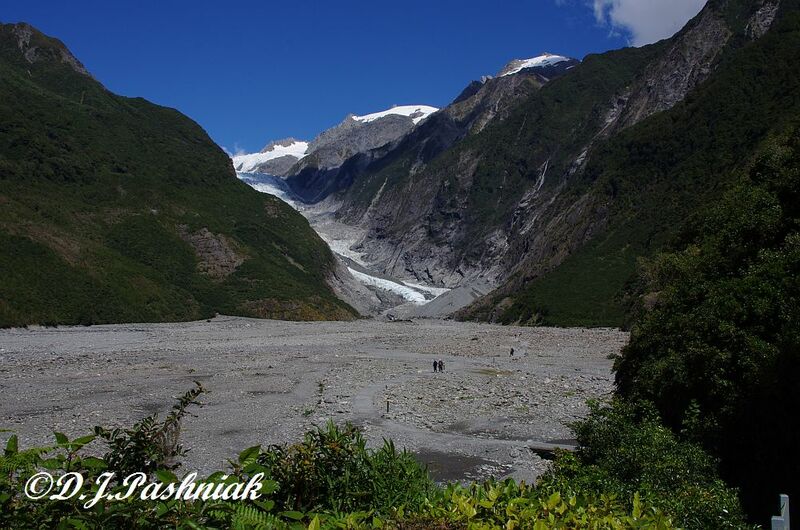 The walk at the Fox Glacier is advertised as 45 minutes - but it felt like much more! 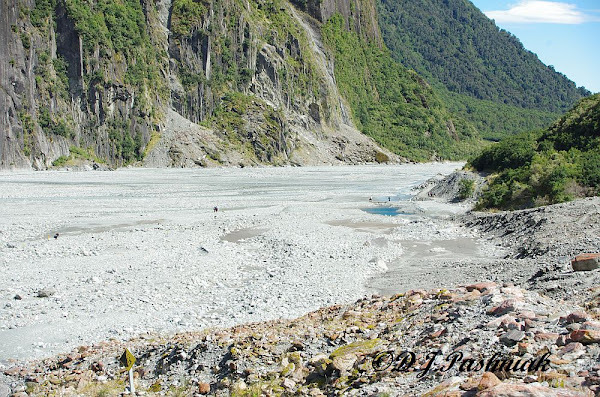 The track is clearly marked and starts off across the flats near the stream which flows out from the glacier. 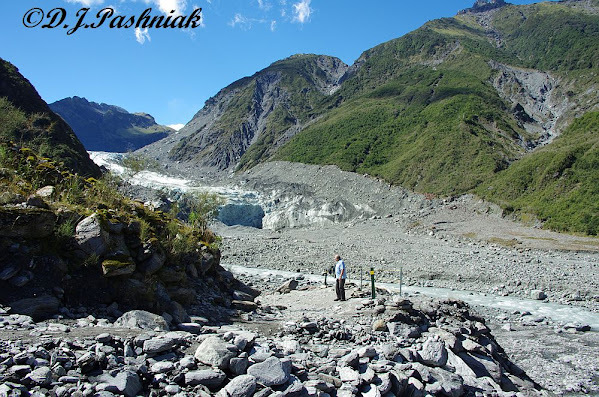 Then the track winds up the hill above the glacier and finally comes quite close to the icefall at the end of the glacier. 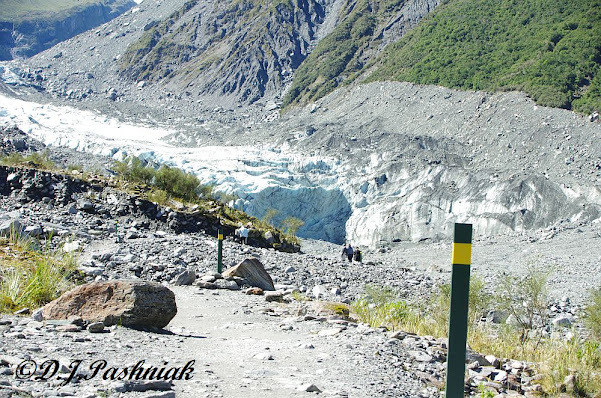 There are barriers well away from the icefall and tourists are cautioned to stay back behind the barriers. 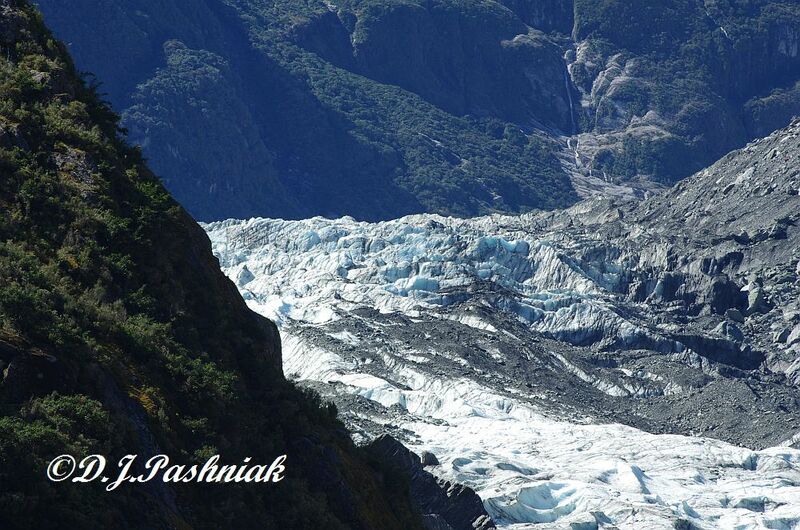 In 2009 two people went around the barriers and close to the icefall. 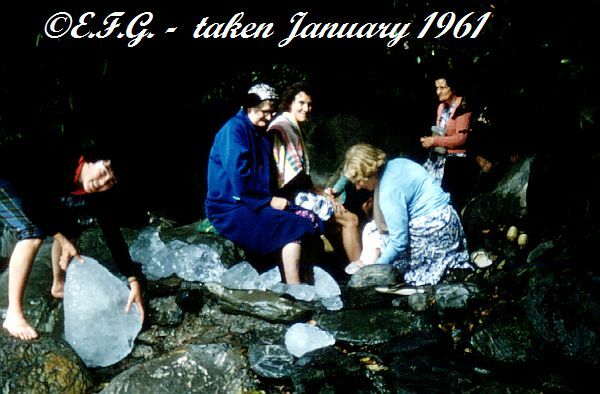 Tragically there was a huge fall of ice as they were standing there and they were both killed. I had the long lens on the camera to take both these photos. The head of the glacier (or at least the head visible from the bottom!) as it begins to descend very steeply. Finally, of course, there is the walk back to the car park! 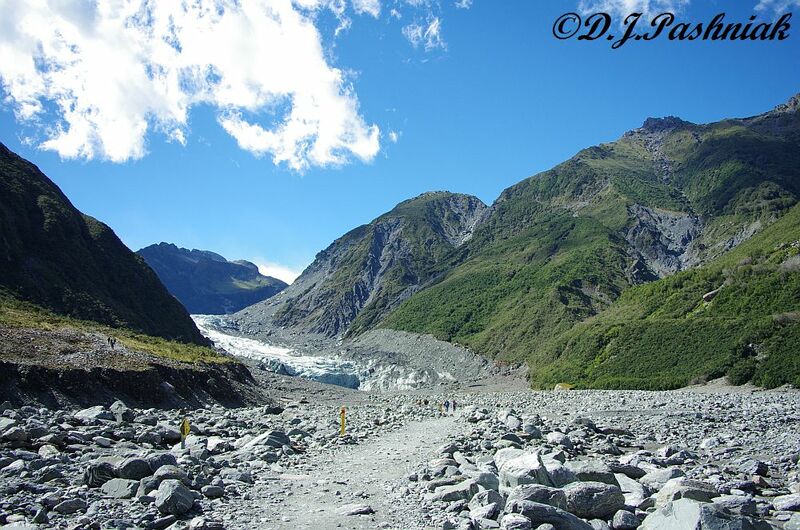 Click on the photo to enlarge it to see the people walking along the track. We went the 25 kms north to see the Franz Joseph Glacier in the afternoon. This was some of the steepest and windiest main road I have ever seen. One road sign warned of a corner that required a speed of 15 kms! 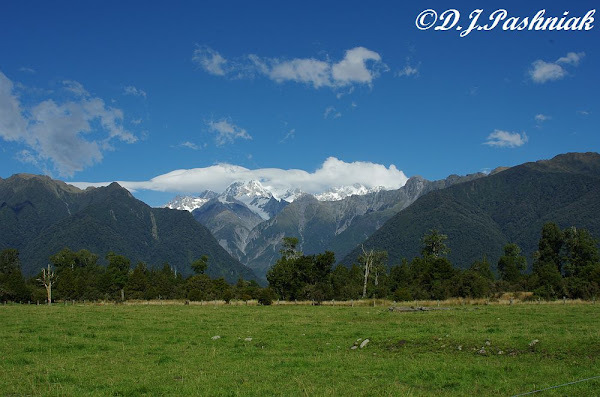 Since I had walked to Lake Matheson early in the morning and then up to the Fox Glacier I decided that I would only walk to where I got good views of the Franz Josef glacier. 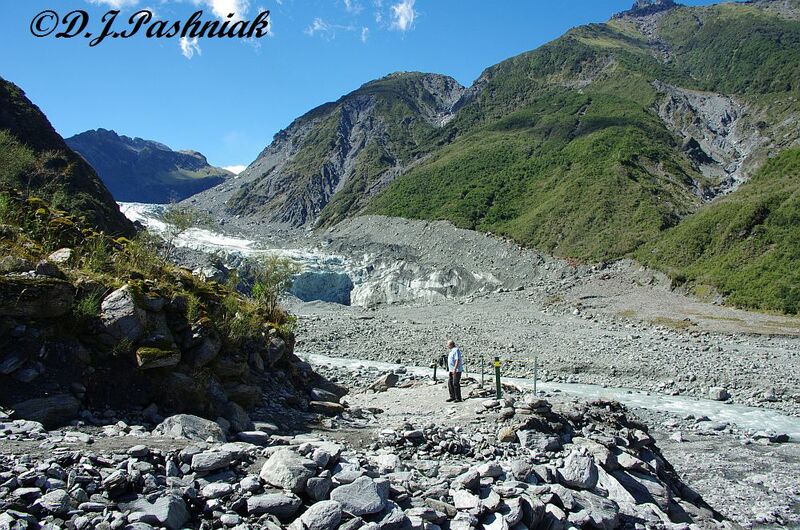 Again, there was quite a long walk across the boulders and gravel previously dropped by the glacier. 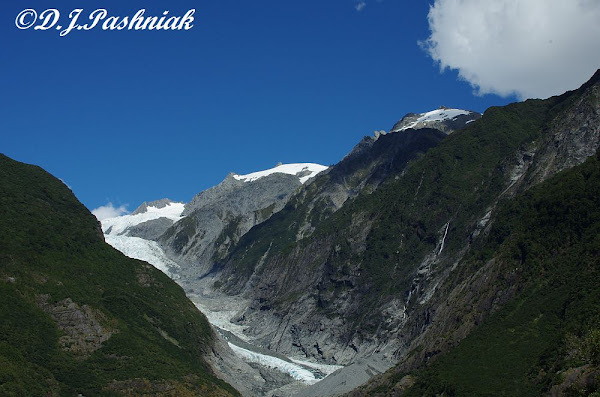 I showed photos of Mount Cook when we visited that area on day two of our trip. Here on the West Coast Mount Cook was clearly visible again through a gap in the mountains. This was the view from a little way down a road west of the Fox township. Extra: If you have had enough of glaciers don't bother reading further! This is History! 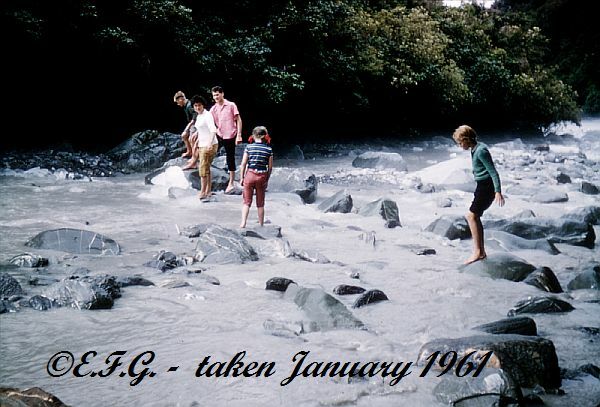 My sister and I were disappointed in Franz Josef Glacier because it was very different from what we remembered. We expected some changes of course but not such great ones. We remembered a beautiful little church with an altar window that had looked out on the glacier. By the time we traveled there the glacier had receded out of sight but there was still a view up the valley into the surrounding forest. The church is still there but is so far away from the glacier now that it is not even kept open! Then we remembered the walking track going down the same side of the valley beside a stream which had blocks of ice rolling along in it. At one place beside the stream there was a natural hot thermal pool surrounded by rocks. We joined some other tourists there and Mum and the Aunts sat with their feet in the hot water while we played with the ice in the stream and then carried blocks of it to surround the pool. None of this was there now! In fact, no one even remembered the hot pool! But I hadn't just dreamed it all. Dad had taken photos! Finally I found a young lady in the visitor's center who looked up history and dates for me and we found that first there had been a huge rock fall which totally changed this side of the valley. Then a few years later there had been a huge outbreak flood from the glacier which changed the valley again. Nothing stays the same! This post is for the Camera Critters Meme. 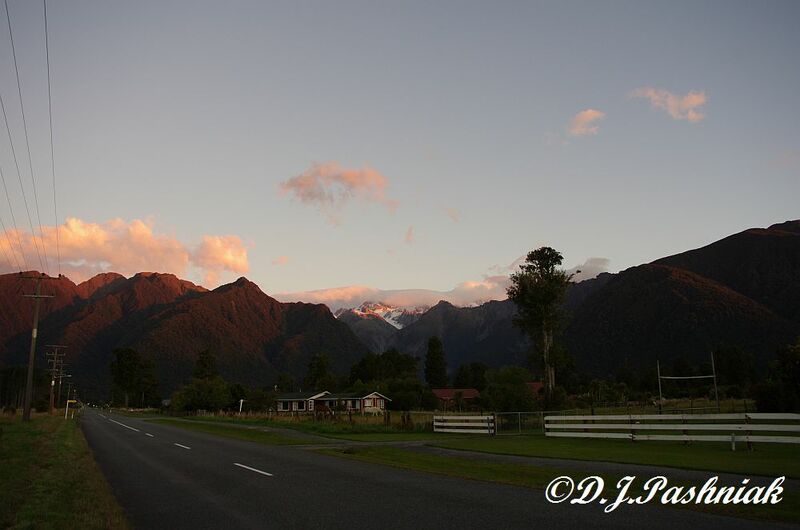 These photos were taken out the front of the car as we were traveling along in south New Zealand. Well, actually, we were waiting to travel again! This is a herd of dairy cattle that have just been milked in the sheds on the other side of the road and are now being moved to a paddock (field?) opposite. 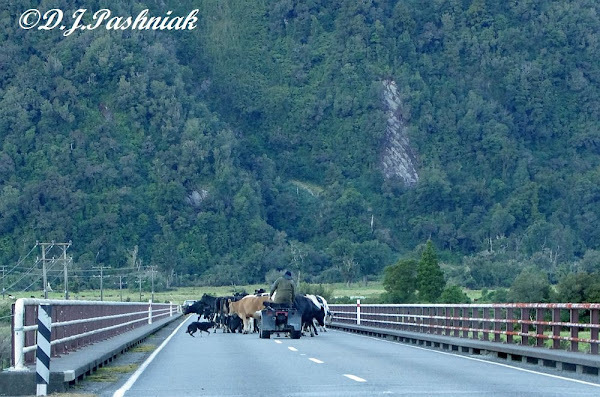 The farmer had a couple of very smart dogs to help him and when the herd got along the road to where the next gate was open there was another car stopped and (I assume) the farmer's wife holding out her arms to keep the cattle moving in the right direction through the gate. The cattle looked as if they knew where they should be going! Movement of cattle like this is often done morning and night across the roads. 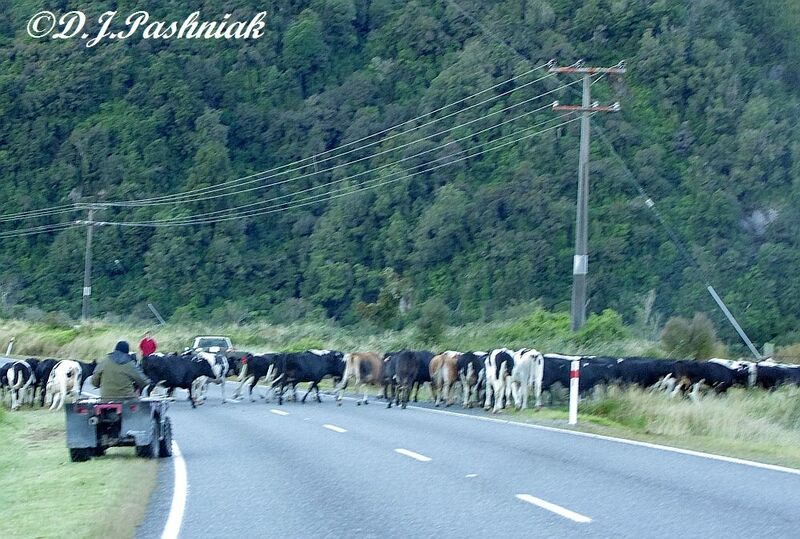 It was a common sight when I was growing up in NZ but I haven't seen it for many years.